writing this post with the fluffiest socks i own, sipping my earl grey and watching the big bang theory on the side. THAT´S RIGHT. i am on a one week holiday from work! anyway, also enjoying the city covered with these golden leaves. 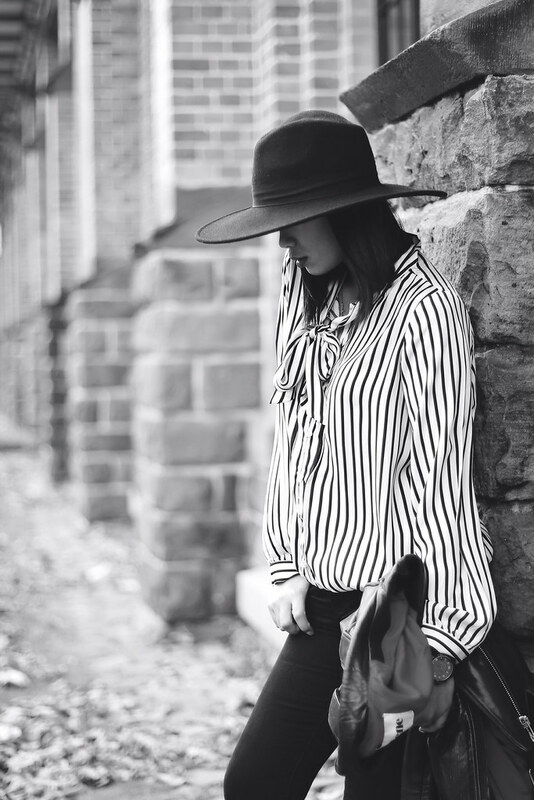 I have a similar shirt, just love these striped black&white beauties *_* Great hat, I have to buy it, definetely! nice pics... love the jacket and boots. manchmal braucht man seine alone-time! Ich liebe deine Lederjacke! cool with a bit of Saint Laurent angst! Really beautiful styling - really love the blouse! Perfect for fall! How perfect! Totally craving for your boots! dann entspann dich mal gut! hüte mag ich nicht so aber die boots sind toll! Love this look, that hat is incredible. and enjoy your holiday!! love the top! cool look! Fantastic hat & style !! I need a hat in my life! New to your blog and just read your little bio onnthe side bar and to have been married and divorced at 19 is a lot to go through but glad you've turned things around and you are happy. Love this outfit. Very edgy yet chic. Following you and look forward to reading your future posts.